Summary High-performance BYOD ten-bay Intel i3-2120 RAID SATA NAS with many serving options. I think I've said before that the money for NAS manufacturers today isn't in selling to consumers. No, the business that they're all after is replacing much more expensive servers that many small-to-medium businesses rely on for storing and sharing their files and, more recently, running virtual servers. 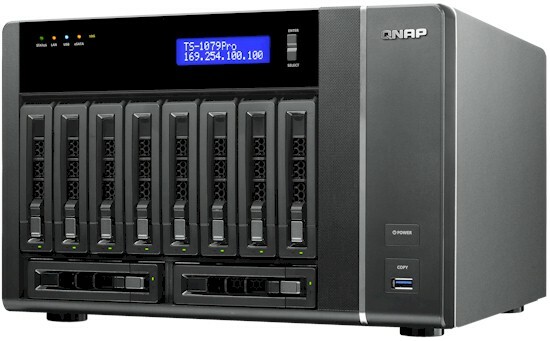 QNAP's TS-1079 Pro is one such contender. It's one of the most powerful desktop form-factor NASes you can buy today and is priced as such. If dropping around $2,500 for ten bays of storage goodness—without drives—doesn't make you flinch, then read on. The TS-1079 Pro actually isn't the most capacious desktop NAS we've tested. That would be Synology's 12-bay DS2411+, which we looked at only a few months ago. Since the Synology is powered only by an Intel D525 Atom, however, it's not in the same class as the TS-1079 Pro. More like it would be Synology's DS3611xs, which we haven't tested and that Synology is asking $3,500 (!) for. The TS-1079 Pro arranges its drives in an eight-vertical/two-horizontal format. This gives it a good-sized footprint (almost 13" wide and deep), so you may need to finally clean up your desk before you can find a spot for it. Given all that weight to support (twelve 3.5" SATA drives are heavy, Bubba), the 1079's limits its use of plastic to front panel bezels and some of the drive trays. The metal chassis seems well built and I heard nary a buzz or rattle from it. The front and rear panel callout diagram below reveals a complete set of expansion ports including two USB 3.0, two eSATA and four USB 2.0. You get two 10/100/1000 Ethernet ports that can be configured in the usual failover, separate or aggregated modes. And you can plug a monitor into the VGA port and a keyboard and mouse into the USBs and have direct root console access. There is also an HDMI port (not called out in the digram below, but above the VGA port) if your monitor uses one of those instead. That expansion slot at the rear upper left actually is a PCIe slot, which is where the optional PCIe dual-port 10 GbE interface resides (an Intel X520-DA2, to be specific). The slot can also be fitted with a dual-port 1 Gigabit adapter or any of these other 10 GbE adapters. My test NAS was equipped with the 10 GbE card and QNAP loaned me another Intel X520 for the NAS testbed (good thing, since the going rate is $450 - $500). So this review will contain the first test results of a NAS using a 10 Gigabit Ethernet connection. The 1079 Pro has some good serviceability design features. The two large (about 5" across) fans are mounted on a panel that be removed quickly via four external screws for easy replacement without even having to open the case. The inside view below shows that the power supply is readily accessible, as is the 10 GbE card. It looks like there is even room for a second power supply, should QNAP come up with a redundant supply option. At any rate, the single supply is easily replaceable. Motherboard replacement, however, is not so easy and looks like it requires some major chassis disassembly. So I left it alone. QNAP specs the CPU as a 3.3 GHz Intel Core i3-2120. It's a bit more powerful than the Synology DS3611xs' 3.1 GHz i3-2100. I didn't try to find out which companion device is used, but it probably is an Intel H67. Both products have 2 GB of DDR3 RAM. But if you look at the middle right of the photo below, the tie-wraps around the socket DIMMs indicate that QNAP doesn't want you upgrading RAM on your own. Also visible in the photo is the 512 MB flash DOM, as well as the NEC D720200F USB 3.0 controller and cable out to the front panel USB 3.0 port. Instead of the two Intel WG82574L controllers normally seen in Intel CPU-based designs, there is only one. The second port is serviced by an Intel WG82579LM, which is in a much smaller package. SATA for the ten drive bays is handled by four Marvell 88SE9125 6 Gb/s SATA controllers mounted directly on the drive back backplane along with a Xilinx Spartan XC3S50 FPGA to tie them together. As is our practice, I ran performance tests using four-drive arrays. So, QNAP supplied only four Seagate Constellation ES 1 TB (ST1000NM0011) drives. These brought total power draw to a relatively hefty 72 W when spun up, with power dropping only to 52 W with the drives spun down. I judged noise as medium, with both quiet fan and drive noise audible in my quiet home office. With a full drive complement I'd expect noise level to rise from both fans and drives. But given the relatively open design of the cabinet, large fans and lots of space between components, I would not expect the 1079 Pro to be a real screamer (noise, that is) under full load. The 1079 Pro supports all the features in its latest V3 firmware (3.5.2 Build 1126T, to be exact). My last feature review was for Version 3.3. Version 3.5 includes the MyCloudNAS feature and ElephantDrive cloud backup. Network backups can now be scheduled or real-time and backed up to rsync or FTP targets. Check out the live demo and take a test drive.